BRAID Africa is a U.S.-based, non-profit organization that responds to the needs of individuals and communities located in the Grand Gedeh county of Liberia. We also assist our sponsored villages in their efforts to integrate war refugees from the Ivory Coast into cohesive, self-sustaining communities. Our organization provides services that address the three fundamental problems our sponsored villages face. BRAID Africa enables healthcare services, provides funding to establish schools for children and provides the seed capital for the establishment of self-sustaining farming cooperatives. ​Rachel, the founder and CEO of our organization, grew up in the Ivory Coast. In the picture above, taken in our first sponsored village, Rachel is greeting a child who has just performed a traditional dance to celebrate peace and prosperity. Since 2011, our CEO’s knowledge of our sponsored region ensures BRAID Africa’s programs integrate with the culture of the communities we assist. ​BRAID Africa has taken the unique step of applying Maslow’s hierarchy of human needs to shape our services strategy. We enable families to take steps up in security, safety, and economic empowerment. Yet, the individuals and communities that we are in service to must help themselves in equal measure. BRAID Africa provides funds to communities so that families can develop successful agricultural cooperatives. This funding is provided in the form of loans. Each cooperative is expected to create economic success, repay the loan, and successfully continue their farming work. The agricultural products produced by these cooperatives sustain families, fund community needs, and produce profit-making products. Education is core to the esteem and social needs of families recovering from war trauma. BRAID Africa provides funds that assist our sponsored villages in the development of schools that meet the educational and social needs of children. Adult education is provided in the form of agricultural education workshops. These workshops impart farming and business knowledge to the families who participate in the cooperatives. Social needs and self-actualization can occur only when safety and physiological needs are met. BRAID Africa provides services that assist and enable our sponsored village residents to receive appropriate medical care, including HIV testing. Our programs also create the conditions in which Ivory Coast refuges can engage with members of their host communities and be assisted in psychological recovery. We have adapted the development of human and community potential as expressed in Maslow’s hierarchy into the specific needs of our sponsored villages and communities. BRAID Africa’s mission is to enable people to move beyond the hardships of war and personal survival. 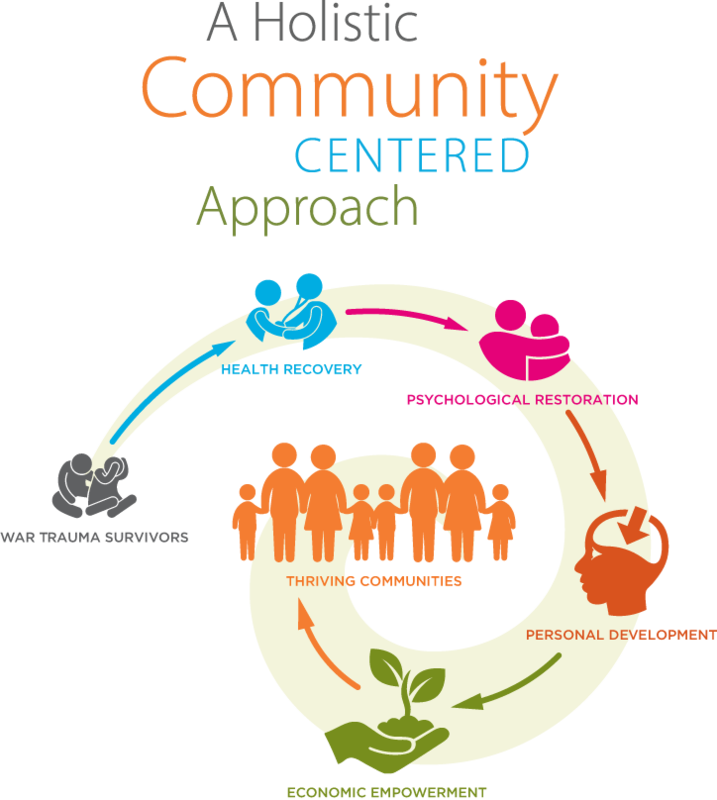 Our programs support and assist them in their work to develop and sustain thriving communities. Ivory Coast war refugees faced traumatic experiences that profoundly impacted them. This was particularly the case with the women who fled the conflict. Upon entering Liberia, the war refugees were integrated into many communities including the villages we sponsor. BRAID Africa representatives personally organized peer group activities to build a support system. This program emphasizes matriarchal guidance and the extension of solace to the younger women. The psychological recovery of many had a strong start. In one of BRAID Africa’s first educational initiatives, we provided the supplies necessary to restore a dilapidated and unsafe school within our first sponsored village, Sehwein. Yet, we did not build the school for our sponsored community. Instead, we provided the building materials so that the parents within the village could rebuild the school for their children. Our first investment in the creation of an agricultural cooperative began with the village chief of Sehwein choosing the individuals within the community who were known to be hard, confident, and productive workers. BRAID Africa then provided necessary farming supplies and technical coaching to the cooperative participants. These supplies included wheelbarrows, seeds, tools—everything that was needed to establish a farming venture. The first cooperative increased rice production from ¼ ton per hectare to four tons. BRAID Africa is a registered 501c3 non proﬁt charitable organization in the United States. Copyright © BRAID Africa. All rights reserved.